By Scott CacciolaIt has not been an easy season for the Mets, who are lurching toward the All-Star break with a losing record. Opposition has come in the form of hard-throwing pitchers, mounting injuries and marathon-length games, but the team suddenly finds itself facing heat from an unexpected source: an American Indian organization. When the Mets approached the American Indian Community House, a New York-based nonprofit organization, in March about helping to organize a Native American Heritage Day, the proposal struck members of the group as a good opportunity to celebrate their involvement in the community. A date was selected—July 25—and they began to plan pregame festivities that would include traditional dancing and singing outside Citi Field. But there was a glitch, as far as the Mets were concerned: they were scheduled to host the Atlanta Braves that day. So in the past week, concerned that such activities might be interpreted by the Braves organization as a form of protest over its nickname, the Mets drastically reduced the day’s activities: no singing, no dancing. And now there won’t be any American Indians, either. On Monday, the A.I.C.H. pulled out of the event, citing frustration with the Mets for thwarting months of planning. The team has removed the event from its online schedule of activities.And:As for the game, the A.I.C.H. began to promote it in early April. In an e-mail to the Indian Country Today Media Network, the group pitched the event as a “great opportunity to educate the public about the stereotypes professional sports teams continue to promote through logos, mascots and fan traditions, such as the ‘tomahawk chop.’” But if Mets officials harbored concerns with that type of language over the coming months, they chose not to express them publicly. It was not until July 1 that the Mets contacted the A.I.C.H. to inform the group of significant changes to Native American Heritage Day: no public-service announcements of any kind, and no pregame festivities outside the stadium. The group could still attend the game and do some fund-raising, but that would be the extent of its involvement. Last Wednesday, a member of the Mets’ group sales department e-mailed the A.I.C.H. in response to a series of questions from the group, which sought an explanation. By Tom Ley[T]he Mets went and fucked everything up. You see, they are set to play the Atlanta Braves on July 25, and the Mets suddenly became worried that the visiting team might see the planned festivities as an anti-Braves protest and get offended. So what did the Mets do? They went full chickenshit, cancelling the singing and dancing portions of the event out of deference to the Braves. By Caitlin Kelly[W]hen the team decided that it would be a nice gesture to organize game-day festivities with the local American Indian community, it took months for someone to realize the potentially problematic scheduling of Native American Heritage Day on July 25th, when the Atlanta Braves were in town. Faced with the prospect of embarrassing their guests, and not wanting to appear insensitive, the Mets followed centuries of American tradition and shafted the Native Americans. By Matt MullinOn Monday, according to Cacciola, they called the whole thing off and decided to ask the Mets for a refund. The cancellation of the event--which stemmed from the Mets' self-serving need to protect themselves, the Braves and MLB from potential protests--is more than that, however. By Travis Waldron[T]his night wasn’t about the Atlanta Braves. It was about actually honoring Native Americans, their heritage, and their culture, something the sports world often professes to do through logos and imagery but rarely ever goes out of its way to actually accomplish. It is, I suppose, understandable that the Mets wanted the night to be about that honor and not about political statements. But if anyone felt awkward about the juxtaposition of an actual honor and logos and cheers that purport to honor, it should be the Braves and Major League Baseball, not the Mets and most certainly not Native Americans. The Mets had a chance to get one right in a sports world that rarely does. Instead, they failed because they worried that the mere presence of a group of people so few in sports care about offending might make the offenders feel a little shame.Comment: Here's a great example of what I've said many times. Indian mascots exist to "honor" the phony, romanticized Indians of history, not real Indians. The sports teams and leagues that supposedly admire Indians don't. Rather, they admire their ability to inflate a sports team into a historical symbol they can exploit. If they have to choose between profits and people, they'll choose the almighty buck every time. For more on the Atlanta Braves, see Braves Reject "Screaming Indian" Cap and Braves Bring Back "Screaming Savage." 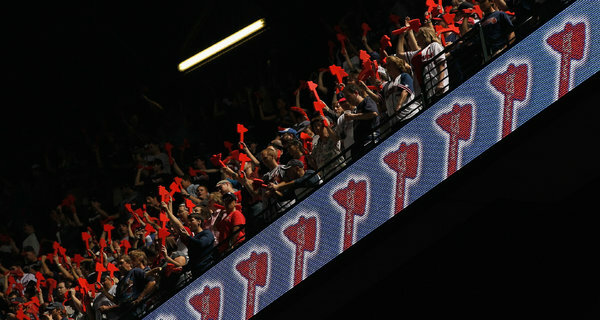 Below: Atlanta Braves fans "honor" Indians by demonstrating how savage they supposedly were.